La Boutique Vintage offers a huge selection of authentic French Club Chair. Born around 1929, it was called "The Comfortable Chair" as it was designed to be really comfortable. Probably why it was so popular in the Gentlemen's Clubs, a place where men could relax, having a drink and maybe a cigar and get away from their home (and wives) for a while. Over time, people started referring to this coveted chair simply as a "Club Chair". Many different shapes were created, but just a few have stood the test of time like "the Moustache" or "The Gendarme's Hat" and of course "The Round Shape" (the only one for the purists!). 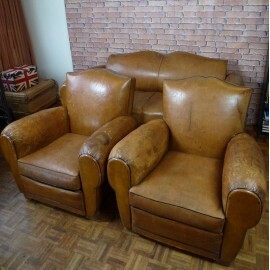 These vintage leather club chairs will bring character and luxury to your interior with absolute comfort! French Club Chair There are 4 products. 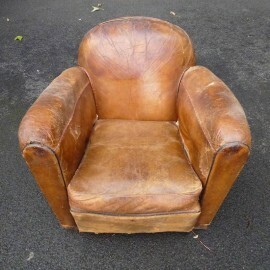 This is a lovely Vintage French Leather Club Chair. Plenty of charm, with nice buttons details on its back. To view our full range visit our French Club Chair category. 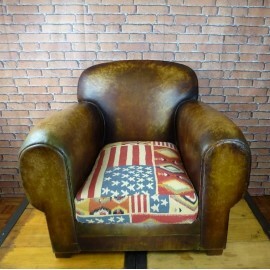 This a stunning French Club Chair. It has a seat cushion made with Andrew Martin fabric, "Americana" collection. The leather has been changed and tanned. It has little imperfections that gives it more character! It is quite heavy as it is original. It would look stunning in any interior! To view our full range visit our French Club Chair Category. 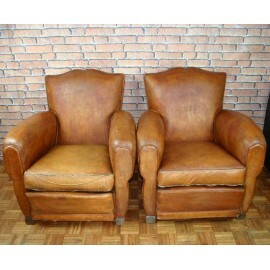 Fantastic Pair of Vintage French Club Chairs called "Moustache Club Chairs" Model c. 1950. The leather is beautiful with a stunning patina. Amazing back! In excellent vintage condition. Perfect for a relaxing moment alone or with your half! To view our full range visit our French Club Chair Category. Complete Set of one sofa day bed and a Pair of Vintage French Club Chairs called "Moustache Club Chairs" Model c. 1950. The sofa doesn't have anymore the mattress, but can still be transformed in a bed. The proportion are really good. A rare set. Pefect as a decoration or for a refurbish project. To view our full range visit our French Club Chair Category.